I tend to loose my key or even a keychain that I'm gonna put the key on... Clumsy me... So rather than buying one again and again... Make one instead! This keychain uses two yarn color and has two different pattern on each side. I'm not really know which one the front side and which one is the back side, but either way this is a cute keychain!! I forgot what hook size I use, but I think it's between #4-#5 (2.5mm - 3mm) and two colors of local cotton yarn. The keychain are made in continuous rounds and join by sewing. I wanted a flatter keychain so I don't put fiberfill on the inside while sewing like the original one. 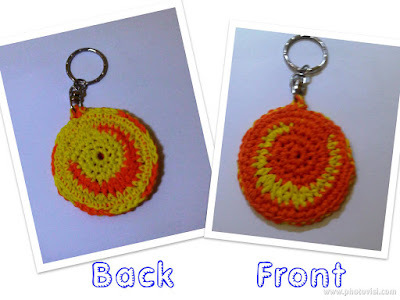 If you're interested, this crochet keychain is created by Midnight Knitter and you can see the pattern here.